Lucky Number runs between 00:01 CEST on the 13th of April to 23:59 CEST on the 15th of April. To qualify for a bonus prize, players must opt-in and stake a minimum of £5 total on a spin where the number 13 hits. Players do not need to bet on the number 13 to qualify for a bonus prize. Each time the number 13 hits, qualifying players will earn a £5 bonus prize. Bonus funds may only be wagered on Live Dealer or RNG table games. Unredeemed bonus funds will expire 7 days after crediting. For example; If you win £5 as a bonus prize, you will be credited with a bonus of £5. This bonus will need to be staked 30 times before becoming withdrawable funds. The maximum number of bonus prizes a single player may earn is five (£25). Bonus prizes will be paid out within 48 hours of the qualifying period finishing. This offer is limited to one per person, family, household address, email address, telephone number or same payment account number. 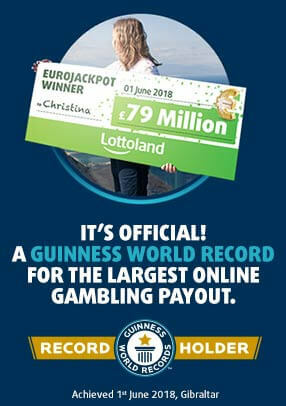 Lottoland reserves the right to withdraw the availability of any offer or all offers to any customer or group of customers at any time and at our sole and absolute discretion.